Doilies are pretty and little and this Light Lace Throw is pretty and big! It's light and airy, but because it's made of worsted weight yarn, it's also strong. This vintage crochet afghan looks great with any color home decor. Follow this lacy crochet afghan pattern to create the perfect wrap for a cool summer evening. This afghan is elegant and feminine, so it makes a great gift for your friend, sister, or mother. Try it today to add a touch of old-fashioned glamor to your home. Love crochet lace? 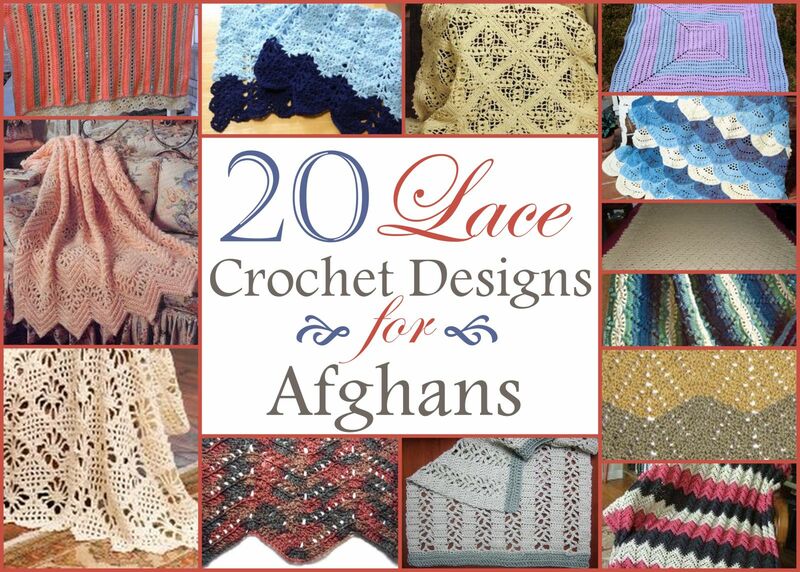 Check out our collection of 20 Lace Crochet Designs for Afghans for all kinds of lace crochet patterns. This lacy little throw is a great fall decoration. Stay warm in the cool fall with this free crochet pattern. Everyone loves a free afghan pattern. Gauge: 15 sts = 4"
Row 1 (Right Side): Dc in 4th ch from hook (counts as first 2 dc, *[dc in next ch, ch 1, skip 1 ch] 7 times, dc in next 2 ch, repeat from * to last ch; dc in last ch, turn. Row 2: Ch 4 (counts as dc and ch-1 now and throughout), skip 1 dc, dc in next dc, dc in next ch-space, dc in next dc, *[ch 1, dc in next dc] 5 times, dc in next ch-space and next dc**, ch 5, skip 1 dc, dc in next dc, dc in next ch-space and next dc; repeat from * across, ending last repeat at **, ch 1, skip 1 dc, dc in 3rd ch of ch-3, turn—7 spider motifs established. Row 3: Ch 4, dc in 1st dc, ch 1, skip 1 dc, dc in next dc, dc in next ch-space and next dc, *[ch 1, dc in next dc] 3 times, dc in next ch-space and next dc,** ch 4, sc in ch-5 space, ch 4, skip 2 dc, dc in next dc, dc in next ch-space and next dc, repeat from *, ending last repeat at **, ch 1, skip 1 dc, dc in next dc, ch 1, dc in 3rd ch of ch-4, turn. Row 4: Ch 4, dc in next dc, ch 1, dc in next dc, ch 1, skip 1 dc, dc in next dc, dc in next ch-space and next dc, *ch 1, dc in next dc, dc in next ch-space and next dc,** ch 4, skip 2 dc and 3 ch, sc in next ch, sc in next sc and next ch, ch 4, skip 2 dc, dc in next dc, dc in next ch-space and next dc; repeat from *, ending last repeat at **, ch 1, skip 1 dc, dc in next dc, ch 1, dc in next dc, ch 1, dc in 3rd ch of ch-4, turn. Row 5: Ch 4, [dc in next dc, ch 1] 3 times, skip 1 dc, dc in next dc, *dc in next ch-space, dc in next dc,** ch 4, skip 2 dc and next 3 chs, sc in next ch, sc in next 3 sc and next ch, ch 4, skip 2 dc, dc in next dc, repeat from *, ending last repeat at **, ch 1, skip 1 dc, dc in next dc, [ch 1, dc in next dc] 2 times, ch 1, dc in 3rd ch of ch-4, turn. Row 6: Ch 4, dc in next dc, [ch 1, dc in next dc] 2 times, dc in next ch-space, dc in next dc, *ch 1, skip 1 dc, dc in next dc and next 2 chs, ch 4, skip 1 sc, sc in next 3 sc, ch 4, skip 1 sc and 2 chs, dc in next 2 chs and next dc, repeat from * to last 10 sts, ch 1, skip 1 dc, dc in next dc and next ch-space, dc in next dc, [ch 1, dc in next dc] 2 times, ch 1, dc in 3rd ch of ch-4, turn. Row 7: Ch 4, dc in next dc, ch 1, dc in next dc, dc in next ch-space, dc in next dc, *ch 1, skip 1 dc, [dc in next dc, ch 1] 2 times, skip 1 dc, dc in next dc**, dc in next 2 chs, ch 4, skip 1 sc, sc in next sc, ch 4, skip 1 sc and next 2 chs, dc in next 2 chs and next dc, repeat from *, ending last repeat at **, dc in next ch-space, [dc in next dc, ch 1] 2 times, dc in 3rd ch of ch-4, turn. Row 8: Ch 4, dc in next dc, dc in next ch-space, dc in next dc, *ch 1, skip 1 dc, dc in next dc, [ch 1, dc in next dc] 3 times, ch 1, skip 1 dc, dc in next dc,** dc in next 2 chs, ch 1, skip 1 sc and next 2 chs, dc in next 2 chs and next dc; repeat from *, ending last repeat at **, dc in next ch-space, dc in next dc, ch 1, dc in 3rd ch of ch-4, turn. Row 9: Ch 3 (counts as dc), dc in ch-space, dc in next dc, * ch 1, skip 1 dc, dc in next dc, [ch 1, dc in next dc] 5 times, ch 1, skip 1 dc, dc in next dc, dc in ch-space,** dc in next dc, repeat from *, ending last repeat at **, dc in 3rd ch of ch-4, turn. Repeat Rows 2-9 seven times more. Finish off. Row 1: With right side facing; skip 2 dc, slip st in next dc, ch 3 (counts as dc), dc in next ch-space, dc in next dc, [ch 1, dc in next dc] 5 times, dc in next ch-space, dc in next dc, turn. Row 2: Slip st in first 2 dc, slip st in next dc, ch 3, dc in next ch-space, dc in next dc, [ch 1, dc in next dc] 3 times, dc in next ch-space, dc in next dc, turn. Row 3: Slip st in first 2 dc, slip in next dc, ch 3, dc in next ch-space, dc in next dc, ch 1, dc in next dc, dc in next ch-space, dc in next dc, turn. Row 4: Slip st in first 2 dc, slip st in next dc, ch 3, dc in next ch-space, dc in next dc. Finish off. Row 1: Skip 1 dc, slip st in next dc, ch 3, dc in next ch-space, dc in next dc, [ch 1, dc in next dc] 5 times, dc in next ch-space, dc in next dc, turn. Work Rows 2-4 as for first point. Repeat border on other side. Weave in ends and block. What a lovely pattern!! Can't wait to try it. Hi Teresa, Hmm. I see the Save Pattern button on my screen... maybe try refreshing your browser and making sure you're signed in? Wow. I like this. It brings back memories of grandma's house, her bed covers, her doilies which are mostly crochet in just one color - white. She also had crochet curtains, table runners and living room set covers. Lovely. Good thing the pattern is just right in front. What a beautiful pattern for a Light Lace Throw! I really like that this pattern takes only one skein of super saver yarn from Red heart. (one of my favs). The pattern looks easy enough to finish in a few evenings of relaxing on the back deck. I can see this in a light purple. Thank you for the easy read free pattern.